Carter's remarks reflect U.S. aggravation with Moscow on multiple fronts. STUTTGART, Germany – Defense Secretary Ash Carter used a U.S. military changing-of-the-guard ceremony Tuesday to blast Russian aggression in Europe, saying Moscow is “going backward in time” with warlike actions that compel a U.S. military buildup on NATO’s eastern flank. Carter presided at a ceremony installing Army Gen. Curtis “Mike” Scaparrotti as head of U.S. European Command and the top NATO commander in Europe. 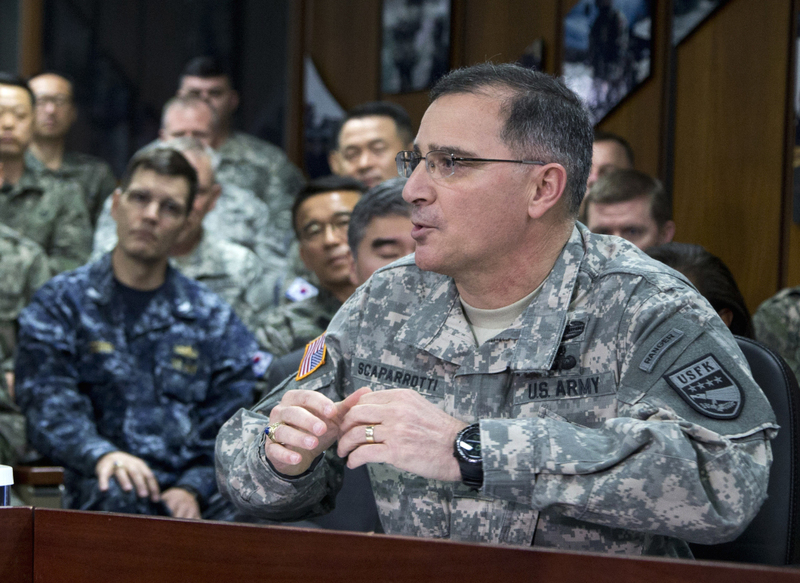 Scaparrotti most recently commanded U.S. and allied troops in South Korea and has commanded troops in Afghanistan. He succeeds Air Force Gen. Philip Breedlove, who has pointedly and repeatedly warned that NATO must better prepare for an adversarial relationship with Russia. Carter’s remarks reflect U.S. aggravation with Moscow on multiple fronts, including its intervention in eastern Ukraine, its annexation of Crimea in 2104 and what Carter called Russian efforts to intimidate its Baltic neighbors – which the United States is treaty-bound to defend because they are NATO members. “Most disturbing,” Carter said, is loose talk by Russian about using nuclear weapons. The end of the Cold War, with the collapse of the Soviet Union in 1991, was thought to have virtually ended the prospect of nuclear conflict with Moscow. But the speeches at Tuesday’s change-of-command ceremony emphasized the possibility of history repeating itself, or at least ending a period of warmer U.S.-Russian relations. Breedlove, who will retire after serving three years as NATO’s top commander in Europe, recalled that he began his Air Force career in Europe more than 30 years ago. “My career started here in a cold war trying to keep the peace. I think my career is now ending here trying to prevent a cold war and continue to keep the peace,” he said. Carter outlined steps the Obama administration is taking to increase U.S. and allied combat capabilities in Europe with the threat of Russian aggression in mind. These include plans to add a third U.S. Army combat brigade in Europe in the coming year as part of a $3.4 billion initiative designed to further reassure allies of the U.S. commitment to their security and to deter Russian aggression. On Monday, Carter said NATO is considering establishing a continuous rotation of up to 4,000 troops in the Baltic states and possibly Poland. That force, which could include some number of U.S. troops, is among options being discussed by NATO officials and is expected to be considered at a NATO defense meeting in June. He made no mention of two post-Cold War developments that many believe prompted, at least in part, Russia’s turn away from the West, namely, the expansion of NATO to Russia’s very doorstep and U.S. placement of missile defenses in Europe.